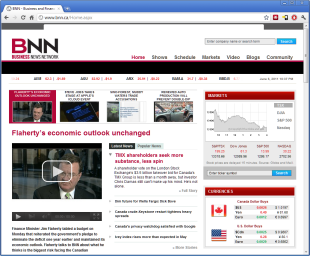 Business News Network (BNN) is a TV channel that delivers Canadian business and financial news. Best of all, all the shows can be watched on-line shortly after they air in real time. This is pretty much the only way I watch the shows since I work during the day. The shows I watch when I can are called 'Market Call' and 'Market Call Tonight'. If you were to watch live, Market Call runs 30 minutes and is on at 1:30pm to 2:00pm ET while Market Call Tonight runs 60 minutes and is on from 7:00pm to 8:00pm ET. Each show features a guest who is a professional in the financial world. Based on who the guest is, the show focuses more or less on a specific market segment, such as North American Large Caps, or ETFs, etc. Callers can call in and ask questions about specific stocks or ETFs and at the end of the show the guess provides their 'top picks'. Do not go out and purchase any top picks. Honestly, if it were that easy we'd all be rich. I use the show to get exposed to new stocks and listen to what the guest deems significant factors that are affecting stocks that I am interested in (or already own). Some guest responses help me to better understand how the business world works. It also helps give the 'pulse' of the financial markets. It helps me to stay engaged. Overtime I have identified a few guests that in my opinion have consistently provided educated answers and are like minded in their thinking. I have almost purchase a stock based on their top picks....but not yet. There's only so much time in the day, so I haven't really been able to dig into the other shows on BNN. Shows that I have seen a few times that I wished I could watch more of include: Business Day, ETF Update, Headline and Money Talk.